This trail camera is designed to take photos and videos of wildlife, observing wildlife area remotely. Identify the movement patterns of wildlife and get more fun. You also can use this game camera as a surveillance system for security. 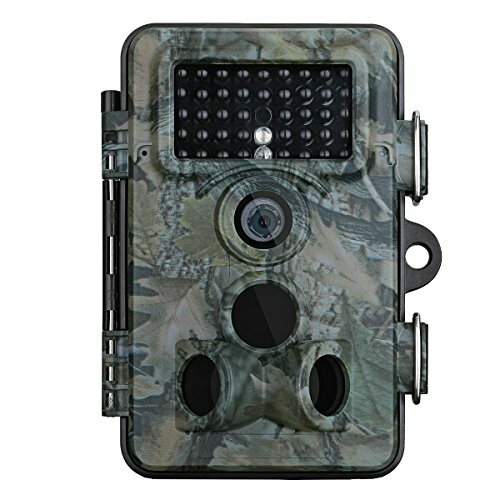 Come with a very durable strap so you can mount this trail camera around a tree trunk. It also comes with an adjustable metal mounting disk that can be used to mount on other surfaces, like the outside of your home for security purpose. 0.2s Trigger Time. Provide you faster trigger speed within 0.5s (compared to 0.7s or 0.6s). If you enable the side PIR function, the trigger time will narrow down to 0.2s, capturing the thrill moment quickly and never miss any shot. Low Glow Infrared Technology. The game camera equipped with 42 black LEDs and it will not produce a bright flash to scare animals away. IP66 waterproof design makes it ideal for any outdoor applications, including home security, wildlife monitoring, surveillance and scouting game. High Quality Shooting. Capture higher solution images up to 12MP (black and white at night) and 1080P HD video with clear sound recording. The video length can range from 10s to 3 minutes. Support multishot modes, up to 9 photos per detection. High Sensitivity. Motion detection: center 40°, side 30°, all three sensors 120°.Trigger distance up to 15m (48ft); IR flash effective to 20 meters (65 feet). Support SD/SDHC memory card up to 32GB. Easy to Navigate. An impressive 2.4″LCD screen for showing battery life, viewing recorded videos and images, personalizing your own setting etc. Up to 6 Months Long battery life with 8AA batteries.